How to Choose the Perfect Hot Tub! Buying a spa or hot tub is a decision you shouldn’t feel rushed or pressured into, so be sure to ask a lot of questions. Like shopping for anything else, knowledge is everything! Before you take the plunge into buying a spa, ask for a private “test soak” so you can feel the jets and the overall comfort of the spa. If you like to download a printable version of this report? Fill out the form below! Learn about the spa's specific features, ease to use and maintenance. When the spa is not in use, does the water always remain hot and clean? Do the jets and jet systems allow you to customize your hydromassage experience? How loud are the jets and pump? Does the spa offer a balanced filtration system? Is the water continuously filtered 24 hours a day to ensure clean, clear water? Are the filters top-loaded for easy access? Is the heating and filtration system fully automatic with no programming required? Is there an automatic clean-up cycle after you exit the spa? Inquire about the heater—typically the most vulnerable component of any spa. Make sure corrosion will not occur. Are the controls user-friendly, easy to operate and adjust? Are there optional features to make spa ownership easier? How is the seating configured? Are you able to move about easily? Is there lumbar support for your back? Learn how the spa was constructed and its energy efficiency. We want you to be delighted with your spa and your spa-buying experience — no matter who you buy it from. The components should be fully tested and backed by the manufacturer’s warranty. Make sure the spa is totally insulated, not just fully foamed. Obtain a copy of the warranty. Ask for a copy of the warranty and read it thoroughly. Beware of the dealer who is reluctant to provide a copy. What spa parts are covered under warranty and for how long? Make sure the heater, surface/structure, components, tile and skirt are included. How does the manufacturer’s warranty compare with other brands? Make sure there are no undesirable limitations or exclusions. Obtain information on the manufacturer and the dealer to ensure you will receive quality service both during and after your spa purchase. How long has the dealer been in business? Inquire about their service policy. Call the Better Business Bureau for more information. Ask yourself: "Who will be using the hot tub?" Do you want a bunch of jets OR are you a soaker? You don’t want to pay for jets that you’re not going to want or use and if you don’t like getting blasted, you might want to consider a hot tub with fewer jets. On the flip side, if you’re looking forward to a hydrotherapy experience, the more jets the better. Where is the hot tub going to be located? Is there a water-resistant radio nearby with waterproof speakers? Will there be a TV within viewing pleasure of the hot tub? For the most part, household stereo systems and speakers are not designed to survive a wet environment. For your listening pleasure, it is strongly suggested that a “marine grade” radio with a “marine grade” CD or DVD player be installed. Some units allow you to add auxiliary audio so you can enjoy other components (like a TV) through the hot tub speakers. Fiber optics not only provide a relaxing atmosphere but also make your hot tub easier to use and enjoy. They provide enough light to help you locate items such as movies, CDs, drinks, towels, the stairs, and more without tripping over things. Most hot tubs require a dedicated circuit with the breaker in plain view. If necessary, be sure to include the cost of an electrician in your total budget. You may also need to make an investment for adequate sub-flooring. 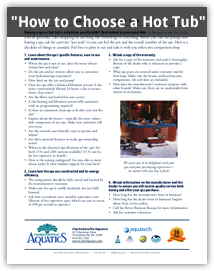 Check the warranty for the hot tub—some may require a hard, solid surface, while others may require something more substantial (concrete slab). All hot tubs should come with a cover. Not only will it help to keep the hot tub clean—it will also save on energy costs by helping to maintain the water temperature. Covers can be large and cumbersome and very difficult for one person to handle alone. A cover helper is a lever that allows the cover to be removed easily and placed alongside the hot tub. When placing your hot tub, you will need to ensure there is enough room for the cover to be lifted off and set to the side. If you have children, you should also consider a locking safety cover or alarm system for added protection. Consider purchasing a utility pump. There is a gravity drain at the bottom of a hot tub. Fully draining a hot tub can take all day. By using a utility pump, the draining process takes only a very short amount of time. While we're talking about emptying the pool, it's wise to think about refilling it. Will the hot tub be placed near a spigot and do you have a long enough hose? While hot tubs all are low-maintenance, they are not maintenance-free. You will need to clean the tub and jets on a regular basis. The best way to make sure you've chosen the right hot tub is to try it out. Take a test soak before you buy. Notice the depth of the water, the seating capacity, and the location of the seats and power jets. Make sure you can stretch out comfortably. A reputable dealer will put things in writing for you. Your contract should include a description of the equipment you’re buying and the set-up date, along with a statement indicating who pays for shipping, delivery, and set up. It should include a description of any aftercare service or schedule checkups and a copy of the warranty. Make sure you’re clear on what the warranty includes and doesn’t include. This list should include parts and labor and what out-of-pocket expenses you’ll be responsible for even if the hot tub is still under warranty. Check with your local building inspections office to secure any necessary permits.